The goal of providing students with a career-focused education influences every part of the Goodwin College experience. Whether serving traditional students getting their first taste of college life, returning students completing a degree, or working adults hoping to advance within their organizations, Goodwin’s mission benefits graduates and employers as well as the regional economy. Well-regarded for its nursing program, Goodwin also boasts a wide range of offerings in business, education, health sciences, human services, and public safety and security. Recently created initiatives in manufacturing and management and leadership were created in response to input from Connecticut employers who are facing challenges to hire qualified workers. Matching graduates to jobs is more than a service for the Goodwin team: it’s a passion. In a unique, individualized approach, they evaluate graduates on the basis of their skill sets, then present them as candidates for positions that have been identified through outreach and networking. It’s a two-sided process in which Goodwin builds relationships with the employers as well as the graduates. 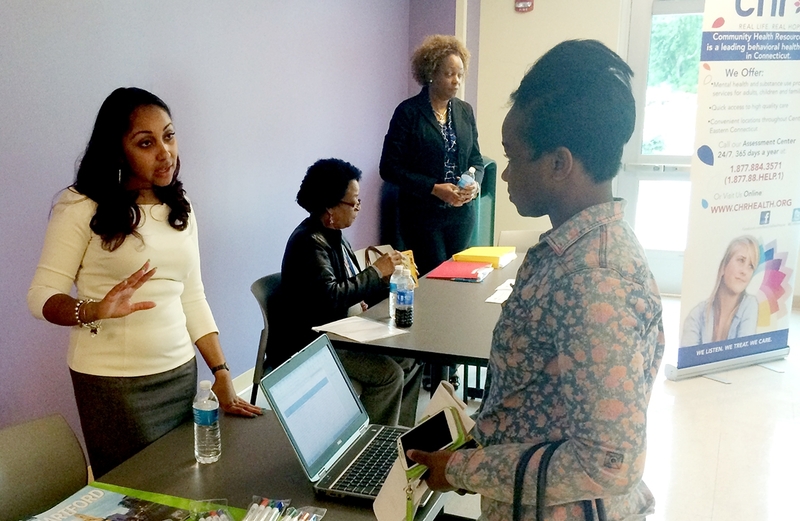 A 2014 Goodwin Career Fair brought potential employers to campus to meet with students for one-on-one conversation. Participating organizations included AFLAC, American Eagle Federal Credit Union, A2Z Global Staffing, Change Incorporated, Connecticut Children’s Medical Center, Community Health Resources, CW Resources Inc., Community Health Center Association of CT, Farm Tek, Hartford Public Schools, Human Resource Association of New Britain, Maxim Staffing Solutions, Mary Kay Cosmetics, StayWell Health Center, USA Security Services, and YMCA of Hartford. Goodwin maintains its partnership with graduates even after they have found employment by sharing news appropriate to their careers. As a result, a number of Goodwin alumni have come full circle with Career Services, notifying them of job leads within their organizations that may be of interest to upcoming graduates. Goodwin College believes fully in designing programs for degrees that lead to jobs. To learn more, visit http://www.Goodwin.edu/LearnMore or call 800-889-3282. The evening of June 20 was ideal in every way: weather, location, company — and the perfect reason for a riverside celebration on the Connecticut River Academy patio, as more than 150 guests gathered to generously support scholarship opportunities at Goodwin College. From the moment they were greeted by the bountiful seafood bar of oysters, clams, and shrimp, the guests — most decked out in their summer blues and whites — knew that the Goodwin College Clambake would be something special. Donors, faculty and staff members, local officials, and other friends of the College spent the beginning of the evening sampling the hors d’oeuvres and socializing with Goodwin students, some of whom had benefitted from past scholarship support. There was also a nautically themed Selfies Booth for those that wanted to dress up in costume and snap a photo or two. At 7:30, the guests were called to dinner with catering by Flanders Fish Market and J Restaurant. Certainly one of the highlights of the evening was the red and white baskets stuffed with nets of steamed mussels, clams, potatoes, and corn, and topped with fresh, hearty lobsters. Experienced lobster lovers coached the newbies on the best ways to crack the shells and get every bit of meat. During dinner, President Mark Scheinberg addressed the crowd, thanking them for their support of Goodwin’s mission. In particular, he called attention to Dan and Betty Russell and Frank and Ceil Collins, whose recent generous leadership gifts to the scholarship fund will make a critical difference in the lives of a number of Goodwin students. This year’s student Commencement speaker, Jenette Davis, offered an abridged version of her speech and was warmly received by the guests. Throughout the evening, the Cobalt Rhythm Kings kept the mood lively, inspiring a few brave partiers to take to the dance floor while others enjoyed their summer desserts. View photos of the festivities. As part of Goodwin College’s Vital Voices lecture series, former presidential candidate and editor-in-chief of Forbes Magazine Steve Forbes told an interested audience that money was not as complicated as they might have thought. Forbes came to Goodwin College on Thursday, June 12, as part of Vital Voices: The T. Boone Pickens Endowed Lectures Series in Education, Innovation and Entrepreneurship. This innovative speaker series focuses on first-hand perspectives of leaders who are making their mark in the business community and the world. Forbes’s lecture was held in conjunction with the CT Forum and R.J. Julia Booksellers. “It’s very special for us to have this particular guest gracing our stage,” Goodwin President Mark Scheinberg said. “You have here a gentleman willing to speak truth” to those in power, he continued. Forbes shared insights from his new book Money: How the Destruction of the Dollar Threatens the Global Economy—and What We Can Do About it to an audience of over 180 people in Goodwin’s auditorium. He said that though economic theory and monetary policy could be seen as boring topics, they were vitally important to the future of the country. He told the audience that though the perception of money is that “only a handful of high priests at the Federal Reserve understand it,” the concept is much simple than is commonly thought. After a lecture on topics ranging from reverting to the gold standard, reforming the healthcare system, and simplifying the tax code, Forbes took questions from the audience. The question-and-answer session was moderated by WNPR Business Desk Editor Harriet Jones. With a circulation of more than 900,000, Forbes’ flagship publication, Forbes, is the nation’s leading business magazine. In 1996, Forbes entered the new media arena with the launch of Forbes.com. Now averaging 47 million unique monthly visitors, it has become a leading destination site for senior business decision-makers and investors. Under Forbes’ leadership, the company has launched a variety of new publications and businesses, which include ForbesLife, the dedicated luxury lifestyle and culture magazine; Forbes Europe; Forbes Asia; and Forbes licensee editions published in over 30 countries. In 1985, President Reagan named Forbes chairman of the bi-partisan Board for International Broadcasting, where he oversaw the operations of Radio Free Europe and Radio Liberty. He was reappointed to his post by President George H. W. Bush and served until 1993. Forbes serves on the boards of The Ronald Reagan Presidential Foundation, The Heritage Foundation, and The Foundation for the Defense of Democracies. He is also on the Board of Overseers of the Memorial Sloan-Kettering Cancer Center and the Board of Visitors for the School of Public Policy of Pepperdine University. As a part of its continuing effort to promote job growth and take students from the classroom to the workforce, Goodwin College Career Services organized an extensive all-program career fair in May. The fair was a response to requests from several local employers, according to Lee Hameroff, Director of Career Services. With 16 different employers on hand, the career fair was intended to match motivated Goodwin candidates with eager employers. “This was a good opportunity” for both students and employers, Hameroff said. The program was initially intended for students graduating between August 2013 and August 2014, as part of the 2014 Commencement activities. Due to the success of the event, and continuing demand from students and employers, the plan is now for the career fair to become an annual event. A2Z Global Staffing, Change Incorporated, Connecticut Children’s Medical Center, Community Health Resources, CW Resources Inc., Community Health Center Association of CT, Farm Tek, Hartford Public Schools, Human Resource Association of New Britain, Maxim Staffing Solutions, Mary Kay Cosmetics, StayWell Health Center, USA Security Services, and YMCA of Hartford. What to do when your wife’s birthday is on the horizon — and you’re relatively certain that the “perfect gift” isn’t waiting to be found at the mall? For Dan Lyman Russell, the answer came in a moment of inspiration. To commemorate her 90th birthday, Dan and his wife, Elizabeth (Betty) Kilgariff Russell, decided to establish an endowed scholarship fund at Goodwin College — the first ever in the school’s history. Not only would the scholarship mark this milestone in Betty’s life, but the Russells, who are East Hartford residents, decided to use her party as a way to encourage others to support the work of Goodwin as well. 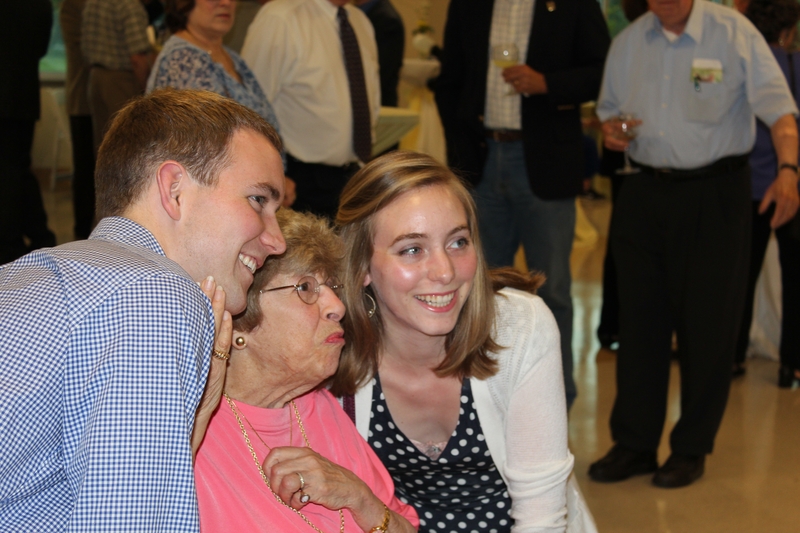 On May 30, more than 150 well-wishers visited Goodwin to attend the party in Betty’s honor held at 195 Riverside Drive. Positioning herself at the main entrance, Betty greeted every guest, making time to share a personal moment with relatives, friends, Goodwin faculty and staff members, and local government leaders. A large gift basket by the door filled up throughout the night with cards and contributions to the fund as suggested in the Russell’s invitation. College president Mark Scheinberg spoke briefly to the audience of the Russells’ innovation and generosity in creating the endowed scholarship. He added that he had made arrangements for a sizeable gift of his own to be added to the fund. When the “birthday girl” stepped up to the microphone, she shared thoughts that were simple, elegant, and heart-felt. After thanking the guests, especially family members and travelers who had come from as far away as Texas, she added simply: “I am blessed,” before going to blow out the candles on her cake. To be eligible for this scholarship, an applicant must be a student majoring in any course of study at Goodwin College; have earned 3.0 G.P.A. or higher; be in compliance with all policies of the Student Conduct Code;have demonstrated financial need; and be enrolled in the terminal year of a degree. Preference will be given to female students who are residents of East Hartford. Goodwin sincerely thanks the Russells for their wonderful commitment. For generations to come, this fund will support and encourage students who are struggling to fulfill their dream of earning a college degree and moving on to a better life. Congressman John Lewis told the graduates of Goodwin College to “go out and help remake our society” during the 2014 Commencement ceremonies on Saturday, June 7. Lewis, the last remaining “Big Six” leader of the American civil rights movement who worked alongside Martin Luther King Jr., was honored alongside the 2014 Goodwin College graduates and legendary UConn basketball coach Jim Calhoun. “I’m honored to be honored with you,” Lewis told the Goodwin graduates upon receiving his honorary degree from the College. Lewis urged the assembled graduates to vote, stressing the importance of voting no matter how you voted. On March 7, 1965, in Selma, Ala., Lewis was beaten almost to death when he led more than 600 peaceful protestors across the Edmund Pettus Bridge to demonstrate the need for equal voting rights. Coverage of the event helped lead to the passage of the Voting Rights Act of 1965. “Be bold! Be courageous! Speak out! Speak out. Never hate. Be hopeful. Be optimistic. Be happy. The way of love, the way of peace is a better way,” Lewis said. “Thank you so much for letting me be a part of your lives,” Scheinberg said. Class Valedictorian Rebecca Whiting, who received her bachelor’s in Nursing, said that after difficulties with scheduling and flexibility at other schools, Goodwin helped her to truly achieve. Class speaker Jenette Davis, a 58-year-old mother of six who earned her associate’s degree in Human Services, said she had to overcome a lot to return to school. But her experiences with Goodwin helped her to overcome those fears. Davis’s son, Shane Davis, sang the National Anthem at his mother’s graduation. Shane is also a student at the College. Coach Calhoun also received an honorary degree from the College, and asked the graduates to consider their voice and how they were going to be heard by the world. 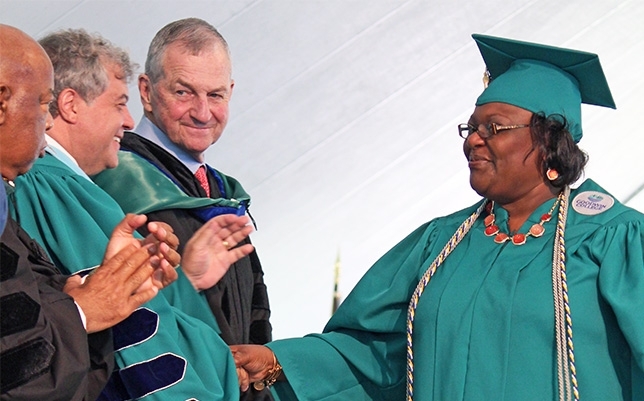 See more photographs from Goodwin’s 2014 graduation here! Click here to view the ceremony on demand. Priscilla Rivera always wanted to attend college, but applying seemed like a daunting task. Goodwin College and the Mutual Housing Association in Hartford gave her the push she needed to become a student. 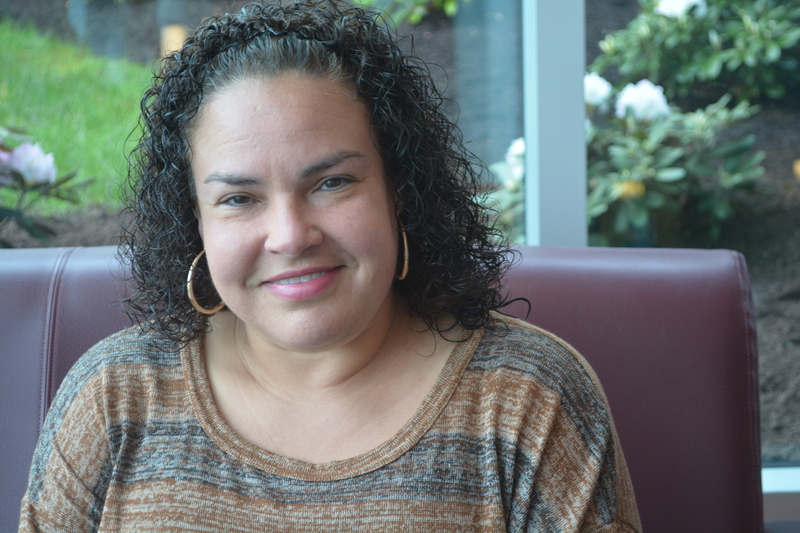 Rivera took advantage of an opportunity to sharpen her skills through a 10-week course on leadership offered by the Mutual Housing Association. At the end of the course, Rivera completed a final project in which she focused on community services for young women and babies. She researched and reported services offered to those in need of help. Rivera received a leadership certificate in November 2011 and was chosen by the Association, who works in conjunction with Goodwin, to receive a two-year scholarship. Rivera enrolled in Goodwin’s Homeland Security program in January 2012, after having been out of school for over 20 years. Originally from New York, Rivera worked at a flower shop in Manhattan and used to frequent the Twin Towers. Three months after she moved to Connecticut in pursuit of a better life, the attacks of 9/11 occurred. Afterward, Rivera decided to pursue a career that would allow her to help protect her country in some way. Her passion to help people and the aid she received from Goodwin propelled her forward. Rivera hopes to set an example for her 15-year-old twins by dedicating herself to her studies and working a part-time job at Goodwin’s Math Lab and Academic Success Center, all while maintaining a stable home-life. Rivera truly appreciates the in-depth material, “homey” environment, and experienced professors. After she graduates with her associate degree this fall, she will be going on to pursue her bachelor’s in hopes of becoming a probation officer.